The psychedelic clouds in Edvard Munch's iconic "The Scream" have alternatively been interpreted as a metaphor for mental anguish or a literal depiction of volcanic fallout. On Monday, scientists hypothesised that the Norwegian painter's inspiration may in fact have been rare clouds which form in cold places at high altitude. 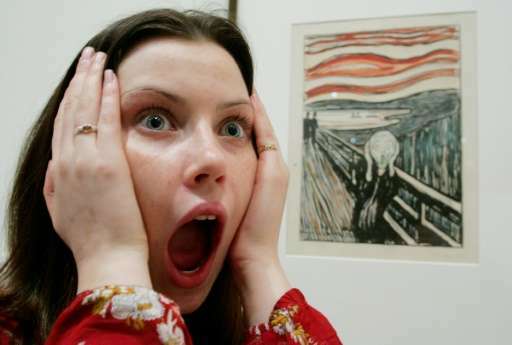 The first version of "The Scream" was released in 1893. It depicts a dark humanlike figure clutching its head in apparent horror against the backdrop of a swirling, red-orange sky. In 2004, American astronomers theorised that Munch had painted a sky brightly coloured by particle pollution from the 1883 Krakatoa volcanic eruption. But the new paper, presented at a meeting of the European Geosciences Union in Vienna, said he more likely depicted a rare sighting of "mother-of-pearl" clouds over Oslo. A volcanic outburst does not account for the "waviness" of Munch's clouds, Helene Muri, a researcher at the University of Oslo, told journalists in Vienna. Furthermore, volcano-tinted sunsets tend to be common for several years after an outburst, "whereas Munch's scary vision was seemingly a one-time experience, the way he described it in his journal," she said. In his diary, Munch wrote of the sky turning suddenly blood red. Mother-of-pearl or "nacreous" clouds, require unusual conditions to form—very cold temperatures in the atmosphere, in a high altitude band of about 20-30 kilometres (12-19 miles). They tend to appear at high latitudes in winter. Because they are thin, these clouds are typically not visible during daytime, but before sunrise or after sunset. "We do know that there were mother-of-pearl clouds in the Oslo area in the late 19th century," said Muri. At least one scientist documented the phenomenon and wrote "they are so beautiful you could believe you are in another world", she added. Similar sightings of nacreous clouds over southeast Norway in 2014, and their striking resemblance to Munch's painting, is what sparked the latest research. "Edvard Munch could well have been terrified when the sky all of a sudden turned 'bloodish red'," the researchers concluded. "Hence, there is a high probability that it was an event of mother-of-pearl clouds which was the background for Munch's experience in nature, and for his iconic Scream." Muri conceded the latest was but "another hypothesis". "There are other hypotheses. But of course, we are natural scientists, we tend to look for answers in nature, whilst the psychologists have suggested it was inner torment that made Munch paint 'The Scream'." What are the 'nacreous clouds' lighting up the winter skies? An artist or one who studies art well might say that *both* inner torment and unusually evocative skies each inspired Munch to paint them both in a work that has found so much resonance in so many people seeing it. Helene Muri: "But of course, we are natural scientists, we tend to look for answers in nature, whilst the psychologists have suggested it was inner torment that made Munch paint 'The Scream'." Edvard Munch was a poor painter, that is to say, he painted poorly. Attempts to analyze the character of the clouds in this crappy painting is just plain stupid. He is depicting his alarm at the sky's appearance but did not know at the time of the Krakatoa event, which is the obvious cause for his alarm. This was established a long time ago. Why revisit this?